A modest little garden or cramped little terrace/balcony does not have to be the end of the world. With a little creative thinking (and a whole lot of dedication to keeping it neat and clutter-free), even the smallest of spaces can be transformed into a charming little relaxation area. Our first image also teaches us a very valuable lesson: style and beauty is not dependent on a big and spacious layout. 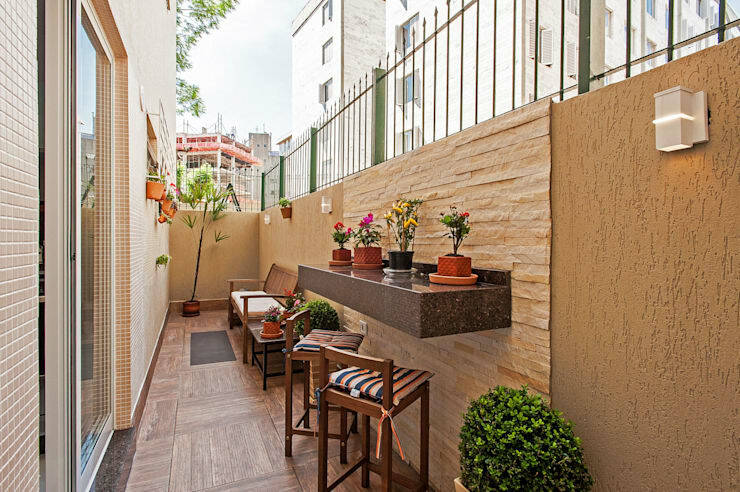 This slim and modest terrace is, let’s face it, a bit on the small side, yet does it look cluttered and messy? You know why not? Because a sturdy dose of creativity and dedication has ensured that it looks neat and spacious. A handful of décor and furniture pieces is all it needs to look elegant and charming. And remember: if you don’t have enough legroom, go up – as in vertically with a floating shelf or two! 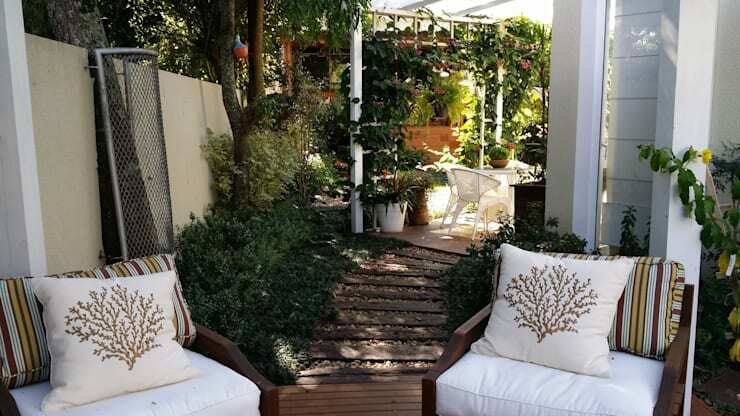 White and creamy wicker furniture help to make this area seem visually spacious – and you can never go wrong with a good bunch of plants and flowers, even if they’re in pots and baskets. Notice that certain areas have been left clear intentionally (such as the brick wall in the background), ensuring some visual gaps for a more wide and spacious feeling. In need of a landscape architect? Check out our professionals page for an extensive range of experts in the fields of architecture, design, and much more. Colour is a funny thing: it can make something small appear big, and vice versa. Case in point, this modest terrace/balcony which, although very small, looks most stylish and welcoming thanks to its ingenious use of colour. Royal blue and candy red draw our eyes to the furniture pieces and their relevant spaces which have been left clean, making this layout feel bigger and more open than it actually is. Of course that crisp white flooring surface doesn’t hurt either. 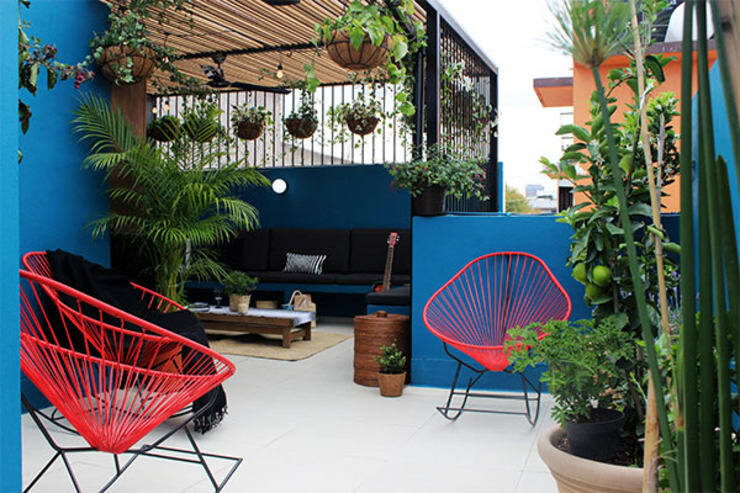 This garden terrace above does everything right. Although its legroom is rather limited, it makes use of an ingenious trick to make its layout seem bigger than it actually is: it leaves gaps open in-between the different furniture pieces. For example, the space between the dining area and lounging corner is wide open, with only charming wooden deck taking up visual space and no additional pieces to fill up the floor areas. Where in your garden (or terrace) can you make use of the same trick? Whether sturdy timber or resistant plastic, ensure that the furniture you place outside can accommodate the relevant sunshine, rain, wind, and whatever else Mother Nature can dish out. This will save you from having to opt for one set of furniture for the shaded area, another set for the uncovered zone, and so forth, effectively freeing up more legroom for you. And please remember to soften up those furniture pieces with some cushions and pillows – but whether you want to opt for cheery tones as shown above, or elegant neutrals is completely up to you and your relevant style – just keep it consistent. Just because it’s a garden does not mean you have to resort to an overkill of two-storey high trees and plants. 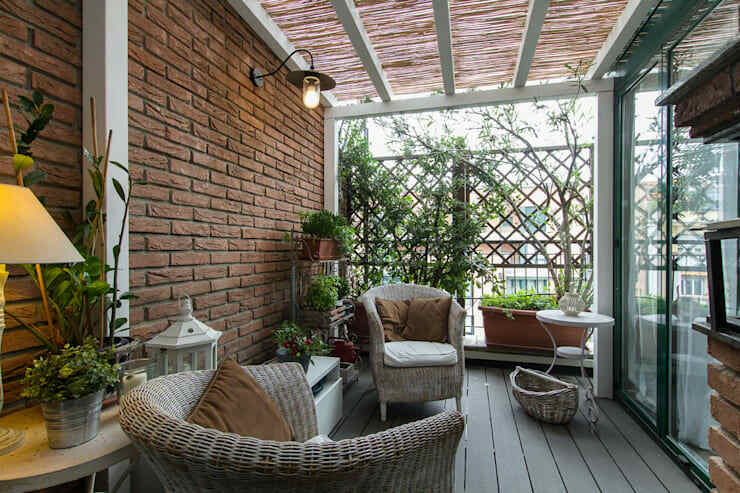 Include some low-lying greenery as well, such as small potted plants or shrubs, which will draw the eye downward in contrast to the higher pieces, such as trees or pergolas. Forcing the eye to look downward will make your brain take in the floor space which, if it’s clean and clutter-free, can help with a visually open and bigger layout. Looking for a little DIY project? Then see how you can: Improve your garden over a weekend. 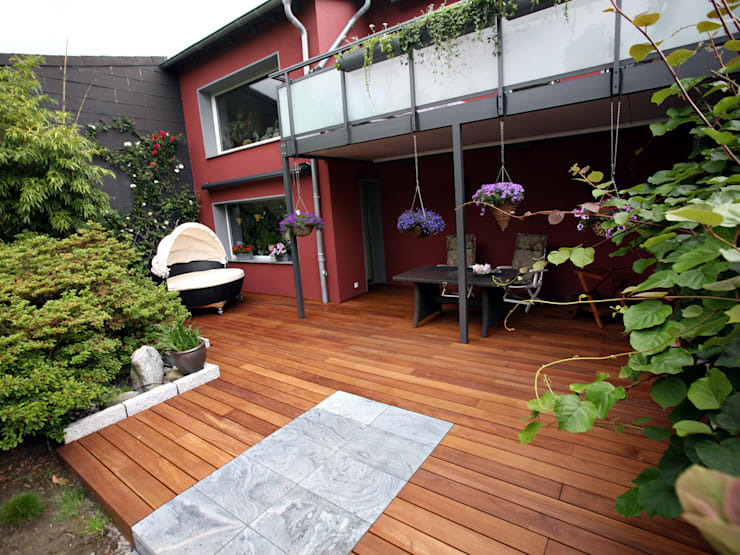 What other tips do you have for making that small patio/garden appear large and stylish?